So maybe you saw the first word of this post and thought kaaallleee. Bleh. Or maybe, you saw the first word of this post and thought kale! Giddy up! I think kale, like most greens and vegetables, can either be really good or sort of just okay depending on the love you put into them. I am one of those people who really enjoys most things that were grown in the earth raw, but not everyone is like that. My husband is an example of this. He like his greens and veggies, but prefers them cooked and alongside something else because he’s is of the camp that puts soup and salad in the “not a meal but rather a side dish” category. I will never understand this as I could eat either or anytime for a meal. Anyhow, if you’re not a fan of root vegetables or particularly don’t enjoy them raw, try roasting them! This brings out their sweetness as the sugars caramelize. Not a fan of strong, bitter greens? Try them in soups or with a creamy dressing with nutty cheese. 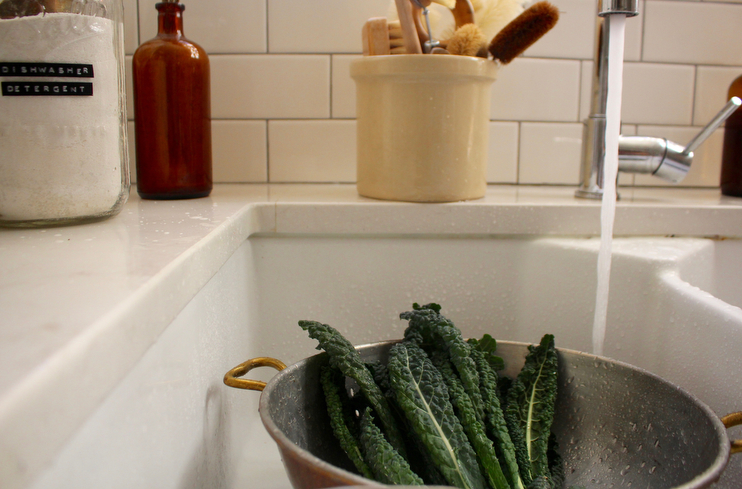 That’s what I did with the last batch of our tuscan kale we grew in the garden this autumn. Knowing there was going to be snow on the way I went out and snipped what was left of our hearty greens and decided to make salads for lunch everyday that week. Now usually around lunchtime I’ll make the same thing for everyone to enjoy around the table in our kitchen, but this week in particular I made the kids something different because I really didn’t think they’d be into my kale salad as a meal. I was wrong. They really liked this one and even starting requesting it alongside our roasts. Apples in salad, mommy?! You betcha. This recipe could not be easier to prepare once your dressing is made for the week because it takes only three ingredients to make, plus your dressing. If you source good ingredients you don’t need a lot of them and this recipe is a perfect example of simple, wholesome food. 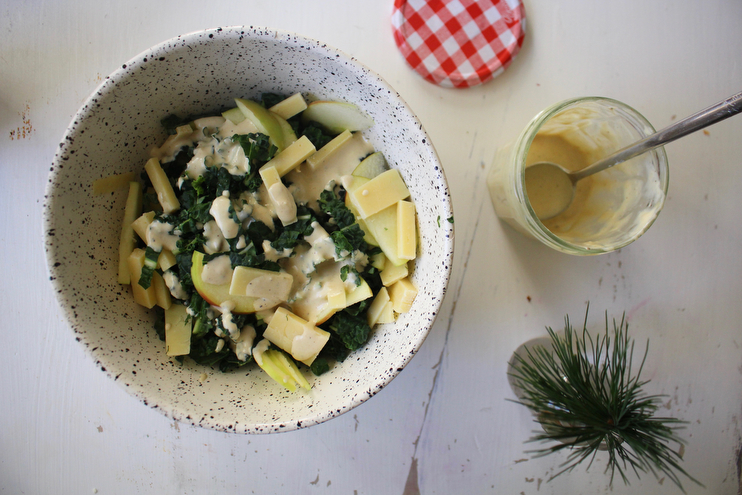 And you may be thinking it’s a bit strange to pair a rather traditional homemade Caesar dressing with ingredients like cheddar and apples, but trust me it’s really, really good. Your favorite farmhouse cheddar cheese chopped into little chunks. It seems like everyone everywhere is making a local variety so I’d go that route. Stay away from bland cheddars precut from the store. They will not give you the nuttiness you are looking for. You’ll want one that is almost crumbly in texture and that is white. One honeycrisp apple sliced into slivers with the skin on. To prepare, blend all ingredients until smooth. Dressing your salad with the homemade Caesar as liberally as you’d like and store the rest in a tightly sealed mason jar. Keeps for one week, but like my homemade ranch, you’ll use it right up I’m sure. What other ingredients are you putting on your salads this season? 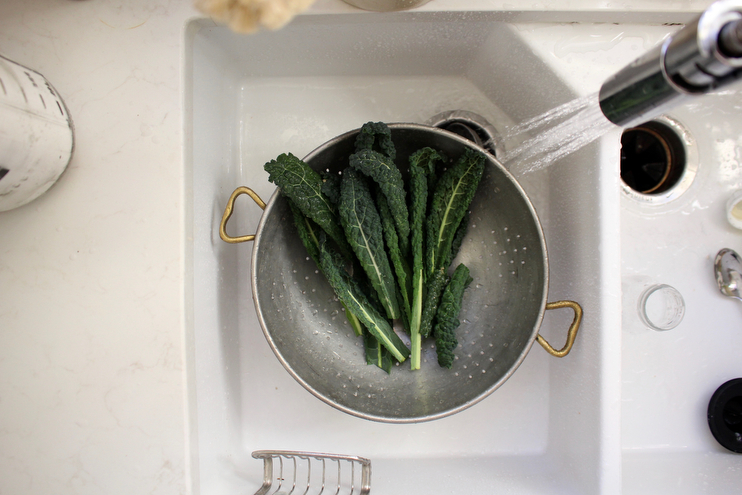 Do you find that your greens take on new notes as it gets colder outside? Mine sure do. I have been wanting to make a savory winter bowl with quinoa as a base as something easy to prepare for our lunches. I also really love apple cider vinegar dressings warmed up on greens with bacon right now. Yum! My mom used to make those for family gatherings, and every time we have one for supper I am taken back to when I was little. Did you grow up with those? I think they are tied to German roots. On another note, I hope you’re settling in and enjoying the turn of the seasons. We’ve been basking in it over here and I can tell you, there’s nothing more comforting than hunkering down and hibernating at home. Thank you for sharing will def give the dressing a try!